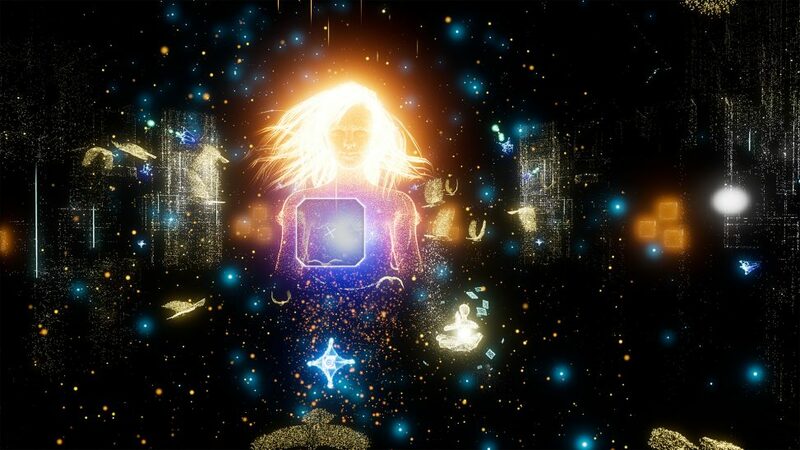 Rez Infinite is the new version of the classic a rail shooter REZ in which the player takes control of an onscreen avatar traveling along a predetermined path through the computer network. The player does not control the overall path, only the avatar’s position on the screen. The player targets foes by holding a “lock-on” button while moving an aiming reticule over up to 8 enemies. Once the “lock-on” button is released, the avatar fires shots that home in on each target. Failure to hit an enemy or projectile in time may cause a collision, which reduces the player’s current evolution level by one and changes the avatar’s form. The game is over if the avatar is hit while at its lowest possible level. At higher evolution levels, the avatar appears as a humanoid figure, while it appears as a pulsating sphere at the lowest level.